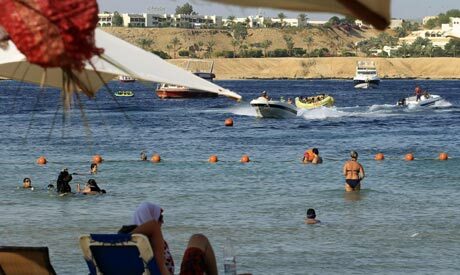 Egyptian beach tourism is here to stay under the country's new Islamist-led government, the tourism minister said this week, as the hospitality sector weighed the effect of recent clashes outside the US Embassy in Cairo. "Nothing will affect beach tourism. We are building on, increasing even, the capacities and the services rendered for our clients coming to our beaches," Tourism Minister Hisham Zaazou told Reuters. "The current government, the current president is backing tourism at large. Everybody is aware that beach tourism constitutes 70 per cent of the traffic coming to Egypt. It will continue to do so," Zaazou added. The future of the industry has become a hot topic with the ascension of Islamist groups to political power in Egypt's first truly free parliamentary and presidential elections. Many Islamists object to women wearing revealing swimwear on public beaches and oppose the sale of alcohol, key parts of holidays for many Western visitors to beach resorts such as Sharm El-Sheikh and Hurghada. Zaazou's comments, made on the sidelines of a Tuesday business conference, suggested there was a middle way. "If there is investment in special kinds of beach tourism for, let's say, Arab investors or Islamic investors as mentioned before, we are welcoming that on top, not in replacement of the current beach tourism," he said. It was the clearest statement yet of the Islamist-led government's stance. Brotherhood officials had previously sidestepped questions over the future of beach tourism, often dismissing the topic as marginal and saying there are more important things to worry about. Other, more hardline, Islamists had been clearer. Last December, the spokesman of the Salafist Nour Party said it was in favour of a blanket-ban on alcohol and 'improper' forms of beach tourism, which were said to "induce vice." Tourism accounted for 10 per cent of Egypt's economic activity during the final years of the Mubarak era. But last year's uprising saw visitor numbers plunge amid sustained unrest and long-running political uncertainty. Revenues for 2011 were around $9 billion, a third less than the year before. Recent figures suggest a mild recovery, with Egypt seeing around 16 per cent more tourists this June than last. But the recovery attempts may be hampered by last week's events, when Egyptians, protesting a film made in America and deemed offensive to Islam, scaled the walls of the US Embassy in Cairo. Four days of clashes ended with two dead and around 250 injured. Zaazou said Egypt aimed to increase the number of visitors from a projected 12 million in 2012 to around 15 million in 2013 -- a number that would equal the number of visitors in 2010. "If we view the tourism industry as a factory, then it is ready for operation tomorrow morning," he said. The government aimed to attract 30 million tourists by 2020, he said. By then, he said the industry should be generating $25 billion in revenue per year - double the $12.5 billion it generated in 2010. You will not expect people spending their holidays with their families in a country where extreme Islamism exists and where people express their dislike about the west like it is common in Na’ama Bay by shop holders. Sexual harassment and nasty comments about your nationality are just an easy walk through Sharm. As Egyptians drink tea Europeans drink beer and wine. If this is not understood then it will never click. Europeans spend a lot of money to get a tan. Will they come to Sharm or Hurghada to wear a Jalabeya like in the north coast Egyptians do which is supposed to be halal? I don’t think so. What you will always be able to attract is tourists who will travel for a less price comparing staying at home in the rain. But these tourists will bring the Egyptian tourism to a final end. Dear Mr.Minister, Tourisim is NOT a factory as you say. A factory is easy to run, you just need to have the right equipment, trained staff, and a product that has demand. Tourism, your ministry, is much, much, more complex. You are dealing with people, who have choices, who have desires and aspirations, and who have expectations. Unless you focus on security, better service, better trained staff, better facilities, you will not be successful. You have to work hard to ATTRACT your customer. I challenge you to do your homework,do consumer research with departing tourists, and develop a real plan. I have been in business for 30 + years. Contact me through email if you dare. I can help you. TH, to runa and manage a factory is lot tougher than tuorism. Egypt offer the tpurism no other country offer. The tourism industry is all established mechanism, there is not much to spend on it as it is seld sustaining phenomenon. What do you mean by hard to attract cusomer, there is well establish mechanosm. You are trying to say only Western people come here, no the people from around the world come here. All the government has to establish a sense of security, where in MUbarak reighn it was hard to get.